Leave St Marks by main gate and go ahead down Osiers Lane through Audley End village, once the medieval village of Brookwalden, built to house the workers at Walden Abbey. Cross the footbridge over the Fulfen Slade, and past the pump and post office, formerly a village school, the listed telephone box and 18th century cottages, numbers 2-20 being the oldest. Cross the road and turn right. Until the 18th century, when the first Lord Braybrooke demolished them, there were terraced houses along here, with a Tuesday market and an annual fair. In 1833 the third Lord Braybrooke moved the popular Audley End fair from here to the Common because it was ‘a positive nuisance’, with drunkenness, gambling and pickpocketing rife. The tall wall is listed and the verge is a nature reserve, with lesser calamint, clary, white campion, achillea and pellitory-of-the-wall. Open the gate and turn left into Audley Park, passing the lodge and the Ice House, in which ice from the lake was packed between straw in a deep well, to preserve foodstuffs for the gentry of the mansion. There may have been a holy well near here, for Holywell Field was enclosed into the park in the 16th century. Follow the path. Look out for Neolithic flint scrapers and remains of woolly mammoth, for prehistoric, Roman, Saxon and medieval material has all been found hereabouts. Unfortunately the pastureland has been ploughed up. There are distant views of the water tower, the parish church and the golf course, which was once a deer park. The large tree is a deodar, grand cedar of the Himalayas. There used to be a lot more trees – a gale in 1833 destroyed 500 trees in the park. Where the path forks three ways, take the middle path through ploughed fields. The path on the right follows the route of an old road; the tree-lined path on the left was used by the Benedictine monks to walk to town, joining directly to Abbey Lane. The abbey was dissolved by Henry 8th in the 16th century. Cross over a slippery wooden footbridge into the next field beside the sewage works. Notice woody nightshade and willowherb, rabbit droppings, stagshead oaks. Beside the track, part of a shield, medieval scalloped horseshoes and Roman Samian ware were once found. Go through a waymarked kissing gate into the next meadow, dotted with oak trees.Distantly can be seen 18th century monuments – to the right an obelisk, to the left a temple. Follow the Madgate Slade, its banks full of Himalayan Balsam, a beautiful but invasive foreign plant. The golf course used to be a deer park, used as venue for the Essex Show in the 19th century. These fields were boggy - hence the siting of the Abbey on higher drier ground where Audley End mansion now stands. Continue ahead through a brick archway and kissing gate and follow an earth track around the flint walls, then over the Granta which, like its other name Cam is said to be Scandinavian in origin - Essex came under the Danelaw in the late 9th century. his farm is called Duck Street, and was a hamlet which housed estate workers. A road through here was an important ‘king’s highway’ which dated back at least to Roman times, but closed in the 18th century.The Abbey had been sited deliberately at the meeting point of four roads, for the benefit of poor travellers. Walk up the track to the main road. The gardens of Audley End can be glimpsed over the wall, beside the 18 century Tea House. Turn left along the pavement. 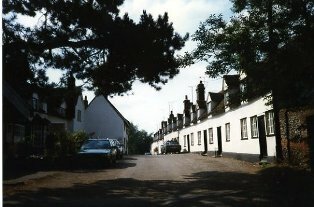 The Cambridge gate and lodge on the right date from the 1760s, with fine chimneys and gateposts and the building behind was a stables, originally the hostel where the Abbey gave hospitality to travellers. 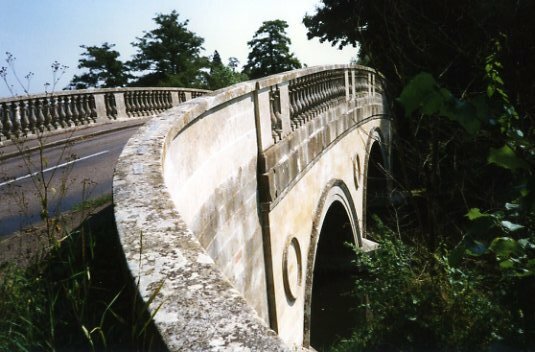 Notice how the ha-ha carefully obscures the road from view of the mansion – there is a clear vista between mansion and the Temple of Victory on Ring Hill to the right. There was a plan in the late 18th century to build a canal linking the Cam and the Stort, supported by the townsfolk, but the first Lord Braybrooke opposed it as it would have ruined Capability Brown’s landscape. In its heyday it took 50 gardeners to maintain the gardens, a dozen just to cut the grass with scythes. The temple is on top of an Iron Age fort guarding this important north-south route along the Cam valley. The Temple of Victory was designed in 1774 by Robert Adam, to celebrate British triumph in the Seven Years War. Up until 1778, the Saffron Walden Woolstaplers’ Guild used to hold their annual march from the town, celebrating Bishop Blaize, their patron saint, with the Mayor and Corporation, a band leading boy bishop, shepherds and shepherdesses in costume. The day ended with drinking and music and dancing. The Walden fields were full of sheep and the town built on their wealth- the Corn Exchange is built on the site of the old Woolstaplers hall. Audley End was named after Henry VIII’s Chancellor, Thomas Audley, granted the old Abbey in 1538 for helping Henry break away from Rome. His successors, the Howards rebuilt it as a hugely expensive mansion, one of the biggest in the country, mostly now gone, for the building today is only a part of the original. For a period it was a Royal Palace, and visited by a succession of monarchs - Elizabeth I,James I, Charles I, Charles II, William III, Queen Anne,George I, George III. They were given presents of saffron grown locally. 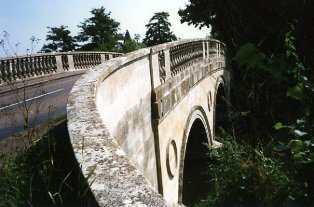 The Lion Gate is said to have a ghost, a carriage which drives out and up towards the Stone Bridge.The gate is named from the lion crest of the Howards, the family associated with Audley End for 200 years. On the other side is Lord Braybrooke’s miniature railway, a magical ride through teddybear-infested woodland, over Grandpa’s Crossing and through Parson’s Leap. Cross the road and turn right to return to St Mark’s College. © Jacqueline Cooper from Discover Walden 1996.